Wow it’s hard to believe tomorrow is Monday and the last week my girls are home before heading back to school next week. It seems like the summer flew by and I’m trying to soak up this last week and all the time with them. When I think about the girls going back to school I also think about how fall is right around the corner but I’m holding on to summer is long as I can. August has to be the month we get the most produce and pickings from our garden. The time where I want to enjoy all the produce and yet get creative with some of it. Sometimes I have to get a little creative, like when we come home to 8 huge heads of broccoli, heads of cabbage, or buckets of tomatoes! With lots of zucchini there are many options and those keep for a little bit after picked as well as other squashes. My beets I’ve been picking and roasting a few times a week. We always have friends and family to share with too! 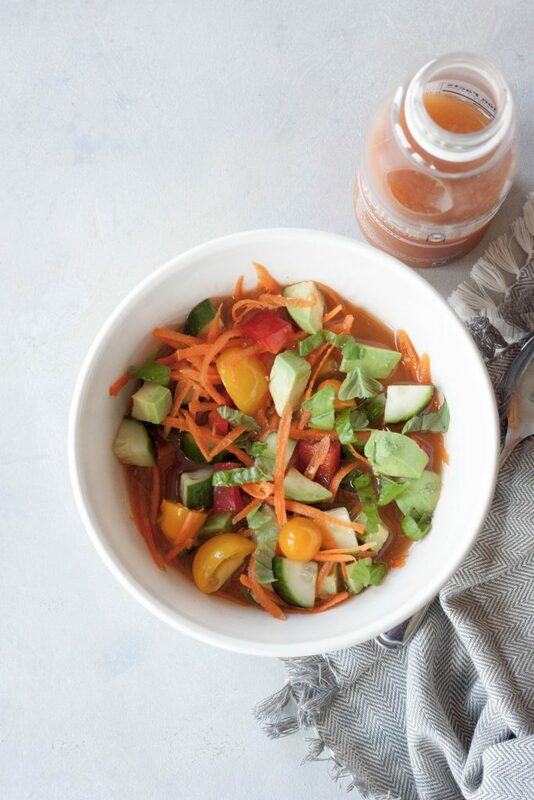 One of the best ways to use up garden veggies is a big pot of garden vegetable soup, or a jar or bowl of Garden Party Soup To Go! We don’t always have time to cook a big pot of vegetable soup, or maybe you just don’t want to heat the house up. Maybe you just want a quick and easy lunch or dinner. Or maybe you just want to pack in all the veggies but don’t want a salad. That is where Garden Party Soup to Go comes in. I love quick and easy, in the summer or busy times especially. I like to grab juices for packing in nutrition in a pinch but sometimes I want more. This Garden Party Soup To Go hits that spot. 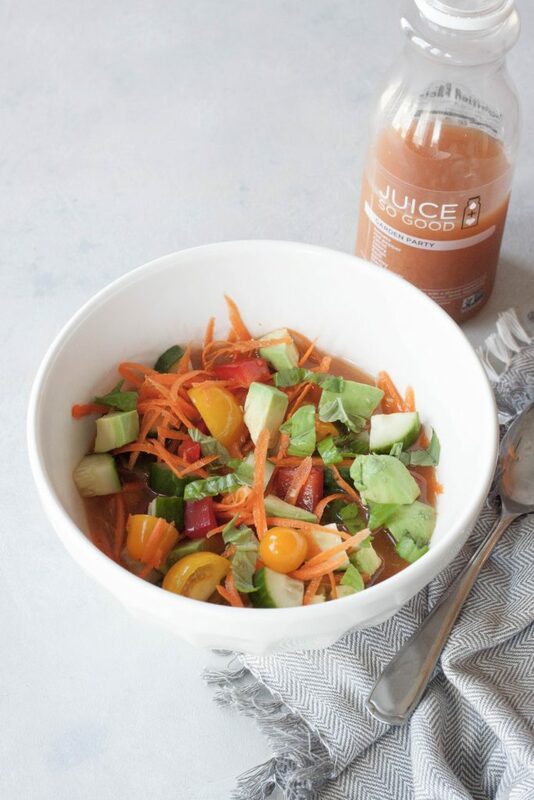 I take a “savory” cold pressed vegetable juice blend, basically a green, carrot, or tomato juice without fruit (well other then lemon that some have, just not a sweet juice). My go to is usually Juice So Good Garden Party (couldn’t be any more perfect) or Juice So Good The Ginger. Both are local juice blends I love but if they aren’t available I check labels and just find a non sweet vegetable blend. Then cut up all the fresh veggies, in this case from the garden (minus the avocado because unfortunately they don’t grow here), and put them in a jar or bowl and add juice. Great for on the go or a quick lunch or dinner at home. It packs whole food nutrition and gives me texture and is a little more filling and satisfying then just grabbing a juice. There isn’t really a recipe for Garden Party Soup To Go, well I wrote up what I used in the bowl shown, but I switch it up based on the vegetables we have and my mood. So it’s easily adaptable to what you have and your favorite vegetables. Will all the beets we have in the garden those often get thrown in since I roast in big batches but if you know beets they color everything else in my bowl. Still tastes good and is fun to watch but photographing well not so much. Chop or grate veggies and you’re good to go. Great to make the night before if you’re looking for a quick grab and go lunch the next day as well as a great use for leftover veggies you have. I also like to add fresh vegetables to add more flavor. 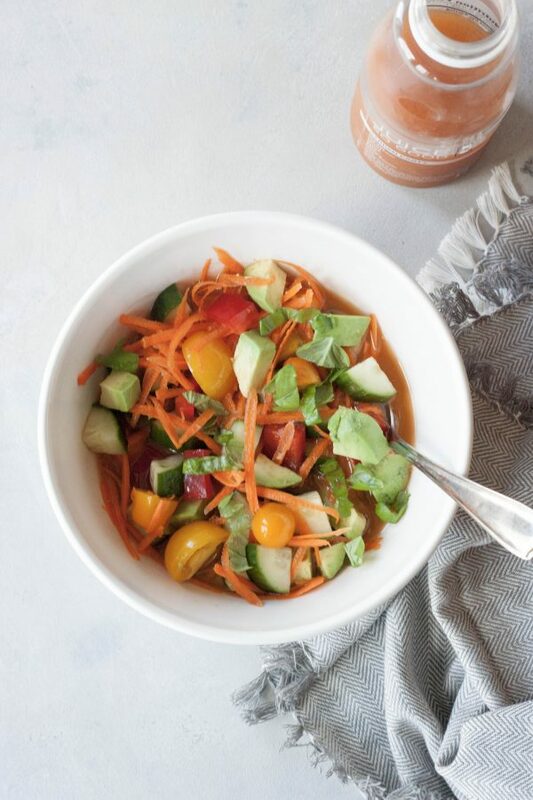 This also happens to make a great Meatless Monday lunch or dinner, although I love it any day, and great way to start the week if you’re looking for a healthy reset after a weekend of indulging. I know summer weekends are always about having fun with family and friends for us. If you have a meatless recipe my co-host Deborah and I would love to see it, link it up below. 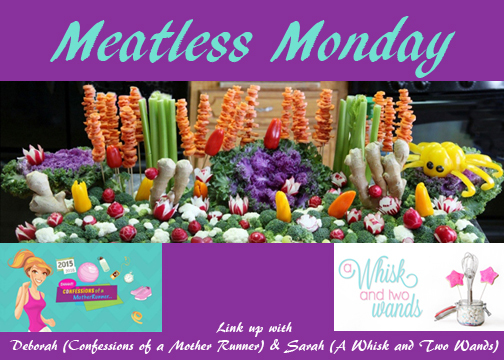 Otherwise I hope you are also inspired by one of the Meatless Monday recipes linked up below! Happy Monday, hope you have an amazing week! 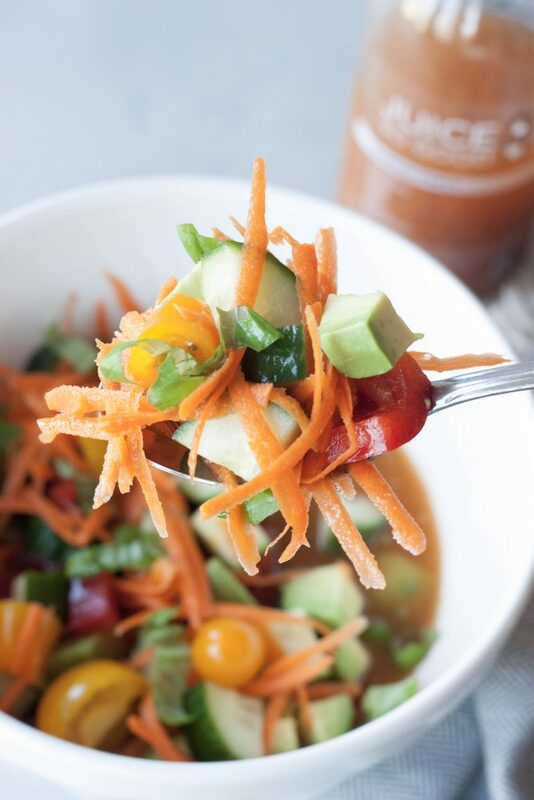 Fresh and easy Garden Party Soup To Go is a no cook, raw, vegetable soup that make a whole food nutrition packed lunch or dinner at home or on the go! Chop and or grate vegetables. 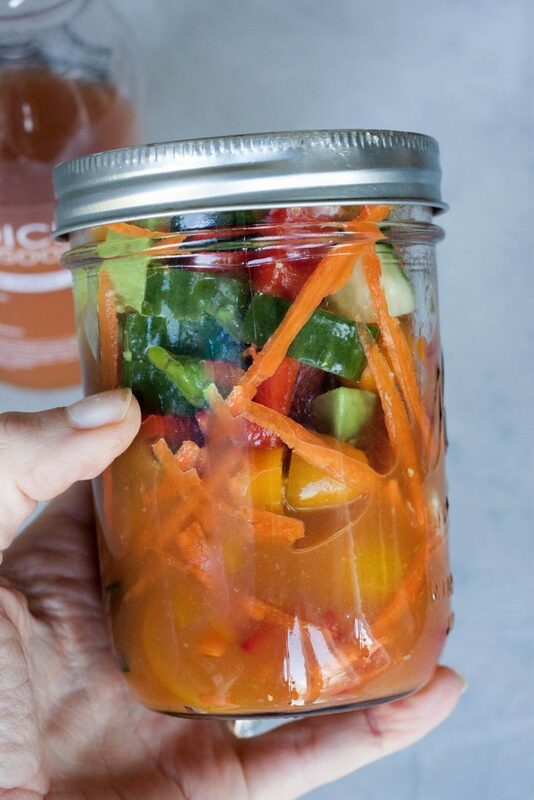 Place vegetables in a jar or bowl, add juice, season to taste. Thank you, it’s so quick and easy you can’t go wrong! Not to mention filling and packs in all the veggies and nutrition.